BEC dropped off our first load of used Nespresso recyclable coffee pods this morning! Our Brisbane office has used 325 coffee pods since getting our new machine this Christmas – that’s 325 non-recyclable coffee cups not sent to landfill. 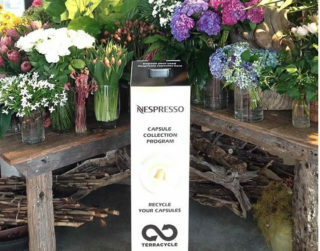 Not all coffee pod machines use recyclable pods, but our Nespresso machine does, and Nespresso has set up their recycling process to be as easy as possible. The closest coffee pod recycling point from our Fortitude Valley head office is an easy 500m walk down the road at Phoebe Stephen Flowers.